Are you bored of your current role in life and are yearning for more satisfaction and adventure? Do you have an interest in natural health and would love to learn more on how to help yourself and loved ones? Have you wondered how more beautiful your life would be learning a life transforming therapy that you could evolve into a business around your family, your hours, your way? Having spent nearly two exciting decades in Media Publishing predominately for high end health magazines such as Health and Fitness and Women’s Health I was privileged to have had the opportunity to experience and review an abundance of amazing therapies from Iridology in London to a lava shell massage in Cairns, Australia and above them all Systematic Kinesiology (SK) was one of the mind blowing treatments that was simply astonishing to experience and witness the swift and lasting results that happened in my mind and body. So much so I embarked on new journey in learning this incredible therapy and forward wind to now and I have been so fortunate enough to be qualified to Diplomat level and not only treat thousands of clients but also teach this invaluable and rewarding system from Foundation through to Diploma level with the wonderful TASK who my courses are accredited to. It is like a dream come true and it is a blessing to be able to help others create their own dreams with the wonders of Systematic Kinesiology. I have had the pleasure to teach hundreds of students over the last decade in both my bi annual Kent/SE London courses and also as an Accredited TASK Tutor for their London Practitioner and Diploma courses. 1. It’s a wonderful journey to either learn SK for yourself and friends and family or to cultivate into a dynamic career and have your own practise whether full or part time. 2. Complementary Health is rapidly growing in the UK with Kinesiology being one of the fastest being recognised and developing in Europe, if not world wide. 3. Systematic Kinesiology focuses on balancing the mind and your emotional wellness and goals, your Energy Systems, your skeletal and physical structure and your chemical and nutritional needs and sensitives from Food Testing to vitamin and mineral deficiencies so each treatment is varied, exciting and super powerful for both the client and YOU! 4. Kinesiology is an authentic, credible therapy as well as tried and tested, with a wealth of clinical trials and scientific research behind a lot of our amazing techniques. 5. If you are an existing Therapist, Kinesiology is one of the most adaptable and practical therapies that you can integrate into your existing skill set- maximising your client and revenue potential no end- this is why we have so many students from Acupuncturists, reflexologists, massage therapists, nutritionists and Homeopaths to name a few. 7. You can train as a Foundation Kinesiology therapist in just 6 weekends over 6 months and have the qualification to then progress to Practitioner /Diploma level if you wish to. 8. We will show you how to effectively use the wonderful BACH Flower remedies to improve client’s wellness and emotional health. Different ways you can apply and use them and how you can even make your own. We will also guide you as to which individual essence supports different meridians and emotions. For example Holly bach flower is wonderful for soothing anger and resentment. 9. You will totally improve not only your health but also the health of your family, friends and loved ones (from newborns to the elderly, athletes to a busy housewife and even animals! 10. You will learn new ways of thinking and identify emotional blocks and how to collapse negative beliefs and behaviours thereby propelling you forwards in other elements of your life. 11. It’s empowering, you learn all about how your body actually works, its intricate systems and how to establish what it needs to fix itself without resorting to drugs. 12. You will learn all about plant based medicine and what herbs and vitamins support what organs and health conditions. You will receive as part of the course 2 comprehensive, nutritional test kits from industry leading healthcare companies and you will learn how to use them to enhance the efficacy of each treatment accelerating your client to wellness and sustaining it. 13. It’s the best job in the world. Promise!! 14. You can work the hours that suit you, you can always specialise in an area that really interests you, an average Kinesiology therapist earns approximately £50 an hour (outside of London). Most people discover they earn the same in a few days a week as they did on full time salaries. 15. Even from the first Level you can go home and help someone instantly – yes really!!! 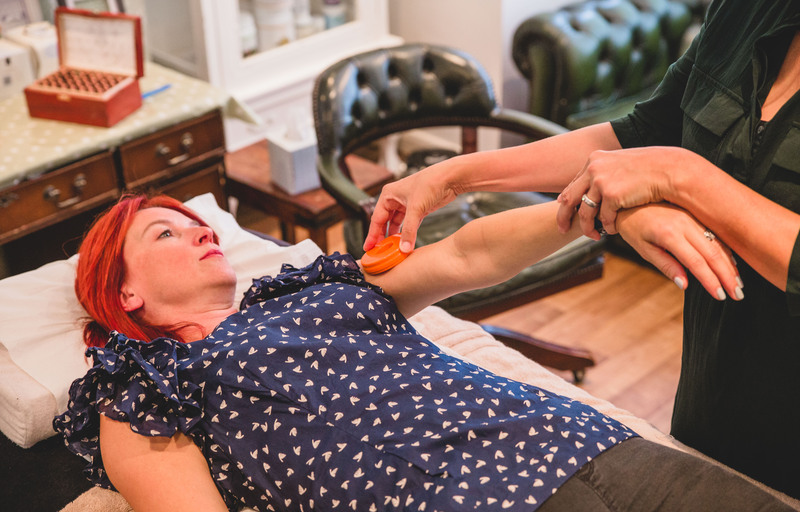 We will show you how to help people with skin and joint issues, hormonal problems, back and shoulder pain, all digestive issues – there is not one health issue that you would not be able to help a client with naturally and effectively by the end of the course.